Previously, I done my Personal Analysis of Starhill Global REIT. On 29th July 2016, Starhill Global REIT announced a distribution per unit of 1.29 cents for its 4th quarter. Although the distribution per unit remains flat as compared to 4Q2015, the annualized distribution per unit totals up to 5.18 cents. In my previous post, I have expected a dividend yield of at least 6.47%. Based on my purchase entry price of 79 cents, this translates to a annualized dividend yield of (5.18/79) x 100 = 6.56%. It has been two months since I did an update on Singapore Savings Bonds. 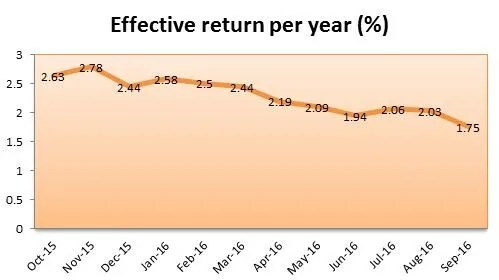 Singapore Savings Bonds is really doing badly. The effective return per year for September has fallen to a low of 1.75%. How was Interest Rate for Singapore Savings Bonds Determined? If you didn’t know, interest rates for Singapore Savings Bonds are determined by the average Singapore Government Securities yields in the month before the announcement. The average yield for Singapore Government Securities is between 2% to 3%. Being curious about the monthly take up rate for Singapore Savings Bonds, I extracted the below statistics from Singapore Government Securities website. As you can see below, the strongest take up was when the Singapore Savings Bonds was initially launched in October 2015. Starting from January 2016 onward, the take up rate fell drastically. There is slight improvement in take up rate from June 2016 onward.